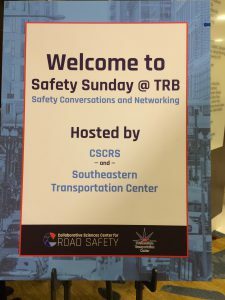 Researchers, students, practitioners, private industry representatives and others interested in sharing ideas about road safety braved the Washington, D.C., snow and slush to attend the second Safety Sunday @ TRB, Jan. 13, 2019. 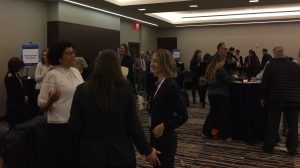 Almost 100 people attended the safety conversations and networking reception, co-sponsored by the Collaborative Sciences Center for Road Safety and the Southeastern Transportation Center, and held in conjunction with the Transportation Research Board 98th Annual Meeting. 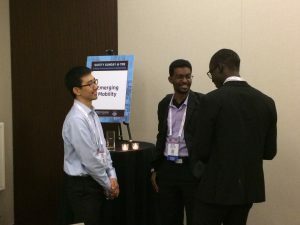 The reception followed last year’s successful networking and professional development event. Browse other CSCRS professional development activities and education activities here www.roadsafety.unc.edu/profdev and here www.roadsafety.unc.edu/education.